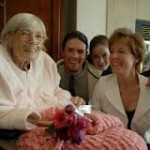 Porter Hospice has been providing compassionate hospice care in Denver, Colorado for over 20 years. Our team of nurses, aides, social workers, chaplains and volunteers will be with you every step of the way to make your end-of-life journey a fulfilling one. We know the importance of living out your life with dignity and respect, surrounded by family and friends. Hospice care can be provided in your own home, a nursing home, or at our hospice residence, Porter Hospice Residence in Denver, Colorado. Wherever you receive your care, we’ll make sure you experience the comforting feeling of home, because home is a state of mind as much as a place. Our hospice programs rely on charitable contributions to bridge the gap between the escalating cost of care and actual reimbursement. Your gift will bring peace of mind to those we serve and allow our families to concentrate on spending precious time together.